When it comes to cheap wedding venue ideas for ceremonies and receptions on a budget, creativity counts. It’s not enough to haggle for a lower price. Sometimes rock bottom estimates are still too rich for a couple’s blood and budget. A venue often needs to be free or as close to free as it can possibly get. Lucky for you, bargain hunting brides and grooms, this list of top 25 cheap wedding venues provides you with plenty of options for your ceremonies and receptions. A cheap venue needs to be three things. It should be spacious enough to accommodate your guest list, easy for your guests to access, and charming enough to serve as the setting for your big day festivities. There are plenty of overlooked spaces in your hometown that could serve as a cheap wedding venue for your ceremony and reception. The key to scoring your ideal spot is asking the right person for permission to have your wedding there so as soon as you’ve set a date, it’s time to start looking for a venue. It doesn’t matter what you’re into — with enough creativity, you can find a cheap venue that fits your wedding theme. Make a list of some of the coolest locations in your city that aren’t ordinarily used for ceremonies and receptions and start contacting the person in charge of running or tending to them. See if the date you had in mind for your wedding is available. If it isn’t, move onto the next venue on your list until you find the perfect space to get married in. 1. Your or a Family Member’s Backyard or Property. 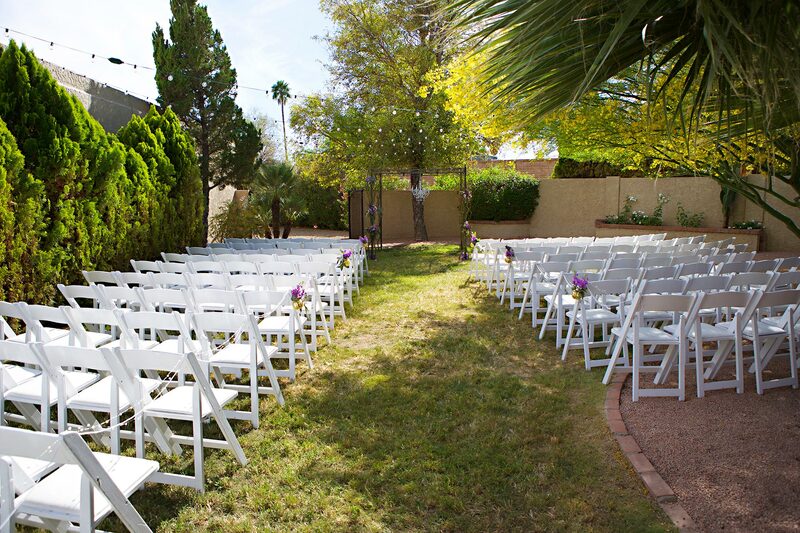 Why not invite others to see what you call “home” by setting up your backyard for your ceremony or reception? You’re already familiar with the location as well as its advantages and limitations. You know precisely how many people you can fit in the space provided and given the time of year of the wedding, what types of flowers and shrubbery to expect. More importantly, it won’t cost near as much to have your wedding at home or in a family member’s backyard or on their property. You can set things up the way you want them to be and use your house as the backdrop for some of your wedding photos. 2. A Public Park. Most public recreation areas offer some type of enclosed area for family parties and community events. The no cost and low cost venues often require a reservation before a person can use them for a big event. Keep in mind that parks are public spaces and therefore, you’ll be dealing with whomever is in the area at the time of your wedding ceremony or reception. To avoid wedding crashers, refrain from choosing a completely open venue where random people can sneak in and consume all of the refreshments. Also, note that you won’t be able to serve liquor in a public space like this, so if that’s a problem for you or your significant other, find somewhere else to have your wedding. 3. A City Garden. What could be more perfect than a venue covered in flowers, trees, and greenery? Nature enthusiasts love the idea of getting married in a city garden. The affordable venue is often centrally located, decorated beautifully by Mother Nature or volunteers, and a memorable location for a bride and groom to say their vows and celebrate their union with loved ones. One of the pluses to getting married in a city garden is all the beautiful flowers you’ll have in your wedding pictures. You won’t need to purchase any nor will you need to find space in your home to display them after your ceremony and reception are over. You get to appreciate the natural beauty of the garden without incurring additional costs. 4. An Art Gallery. This is a great idea for artists and people who appreciate art. If you’re fortunate enough to have an art gallery in the city you live in, it could very well serve as a space for your wedding ceremony and reception. This is an enticing reason to get to know the owners of the art gallery and visit their exhibits prior to your wedding day. If given permission to have your wedding in their space, make sure to ask your guests to be mindful of the artwork throughout the gallery. Showing appreciation for the artists is one way to pay respect to the gallery owners who so kindly gave you their blessing to use their space for your wedding day celebration. 5. A Bed and Breakfast. Take care of lodging and wedding arrangements at the same time by renting rooms at a local bed and breakfast and using a common area for your wedding ceremony and reception. This is a perfect option for smaller weddings where larger venues aren’t ideal. The relaxed atmosphere and homey feeling you get while staying in a bed and breakfast is perfect for combating wedding day jitters. More importantly, you’ll have somewhere to put up your guests without giving up your home while you’re away on your honeymoon. After a long day of celebrating, people can retire to their rooms for some much needed rest. 6. A Lighthouse. If you live in a coastal area, getting married at a lighthouse may be the right idea for you. Some of the lesser visited lighthouses offer cheap rental rates for special events like weddings. Make sure to contact the owner or lighthouse keeper way in advance to make sure your wedding date is open. People tend to hear about cheap venues from friends or family members and jump on them as soon as they can. If you don’t want to miss out on getting married by the sea, reserve your dream location early. Most places require a deposit so keep this in mind when planning your budget for your wedding. 7. The Beach. Who doesn’t love the idea of a tropical wedding? People living in coastal states have got it made when it comes to beach ceremonies and receptions. Just dust off your sandals, wear a sarong, and say “I do!” with the sounds of the ocean providing the soundtrack to your life together as a couple. Many public and private beaches are available for creative couples to get hitched on. Just set up some beach chairs and sun umbrellas and prepare to have the time of your life. You won’t need much to make your guests happy besides some cool drinks, some good tunes, and maybe some sunglasses to give as party favors. 8. The Lake. Use your love for the Great Outdoors to give you an excuse to get married at one of your favorite locations, the lake. Not only will you have plenty of space to accommodate a large guest list, you’ll take amazing pictures in a natural setting. Think about all the beautiful trees you’ll have in your photo. Consider a fall wedding so you can capture the leaves changing colors in your photographs. Many lakes have recreational areas that you can reserve for very little money. Just let the person in charge know that you plan to have a wedding ceremony and reception there and they’ll take care of securing the location for you on your big day. 9. An Animal Shelter. If you and your partner love animals and have made a career or hobby of rescuing shelter dogs and cats, get married on the grounds of your local animal shelter may be an idea for you to entertain. Not only would it be cute to have some of the animals in your photographs, you could ask that your guests make a donation to help those in need rather than buy you a toaster or new set of bed sheets. They can bring items from the shelter’s wish list or make a monetary contribution, whichever feels best to them. 10. A University. Why not get married at your alma mater? As an alumnus, you have some privileges that aren’t afforded to everyone. Contact university officials and let them know your plans. They’re likely to allow you to use a conference room or area of the university where class isn’t in session for your wedding day festivities. Make a small donation to the school as a token of your appreciation for their kindness. The money you contribute will likely help a student achieve his or her goal of obtaining a college education. 11. A Fire Station. Are you or your spouse involved with the fire department in any way as a paid employee or volunteer firefighter? If you are, you may be able to make arrangements to get married at the fire station where you work. The benefits of getting married at a fire station is that you have a small but interesting space to work with and fire trucks to take photos on (that is, of course, as long as they are not in use). A firefighter theme is easy to pull off. Just think in terms of red and white. Use it to fuel the scorching hot romance you’ll have with your new husband or wife. 12. A Police Station. Again, this works well for couples with law enforcement backgrounds. It’s not a place where people get married often which is what makes it unique and appealing. Keep in mind that a police station is just like a business in the regard that its employees have things to do throughout the day. Stay out of your fellow police officers’ way so they can do your job and your police chief will likely have no problem whatsoever letting you use space in the station to serve as your wedding venue. Be mindful of your guest list and keep it limited to your closest family members, friends, and work colleagues only. 13. A Winery. Wine lovers unite in a comfortable and friendly setting. The advantages of getting married at a local winery are quite obvious: You’ll have your fill of wine! If the winery has a vineyard, you could very well get married outdoors and then bring the party inside. Ask that the winery make recommendations of which wines to serve your guests with their meal. You could offer pairings of entrees with different varieties of wine. This is a great way to introduce your guests to the world of vino and keep every happy and in good spirits for the duration of your events. 14. A Casino. Casinos typically have public spaces for rent. Depending on their popularity and the date and time of the wedding, you can get a really good deal on this choice of venue. One of the best things about getting married in a casino is that you don’t have to provide entertainment for your guests. They can hit the slots and tables on their own and jam out to the live band that plays while people gamble. They’ll also get their fill of non-alcoholic beverages for free which is a win-win for you. If there is a restaurant onsite or a buffet offered, you can provide food to your guests quickly, cheaply, and easily. 15. An Airplane Hangar. What’s cooler than an old airplane hangar as a venue? Most people can’t argue with the degree of awesomeness an aviation theme brings to a wedding. If your significant other is a pilot, loves planes or just wants to travel the world with you, find the owner of an old hangar and see if they’re willing to work with you on price. You’ll have one of the most unique settings for your wedding and the wide open space that once held airplanes can hold a large guest list’s worth of people. That’s great news if you can’t spare hurting anyone’s feeling by not inviting them. You can have as many people as you want at your wedding without any worries about reaching maximum capacity in a large hangar. 16. A Bowling Alley. Bowling alleys are great for parties and get-togethers, but few people consider getting married there. That’s where good research comes in. If you’re allowed to rent a space for a pre-determined amount of time, you could very well get married and have your reception at the bowling alley. Rent lanes and bowling shoes for your guests. Order pizza from the concession stand and make it a fun, family-friendly evening for everyone involved. The kids will dig the venue because of the video games and the adults will love the casual atmosphere bowling provides. You don’t have to worry about music because the bowling alley provides the soundtrack for your big day already. 17. A Campground or RV Park. If you love the ruggedness of the Great Outdoors, a campground or RV park is a great place to get married especially if you’re an avid camper. Have a cook out and feed your guests burgers and hot dogs. Build a bonfire and roast s’mores. There’s a lot of advantages to getting married at a campground or RV park. Your guests will have access to restrooms, you’ll have plenty of space to dance and converse with others in, and you won’t be limited to having just a few people at your ceremony and reception. Make sure to get permission from the owner or manager of the campground or RV park before inviting everyone to help celebrate your special day. 18. A Skating Rink. Take a walk down memory lane by renting out your local skating rink for an afternoon of fun. Make sure to bring a change of clothes because you don’t want to skate in your wedding dress or tuxedo. Keep food options simple like you would if you had a bowling alley wedding. Pizza, hot dogs, and pretzels serve as the perfect afternoon lunch and snack. Ask the owner of the skating rink to keep your cake for you until you’re ready to cut it. Have a great time making memories at the rink with your guests. They’ll love how fun and carefree the experience was and want to share their memories of your wedding with everyone they know. 19. A Library. Bibliophiles love books and couldn’t think of a more exciting place to get married than their own public library. Equipped with conference rooms and meeting spaces, it serves as the perfect location for a low-key get-together. Speak to the head librarian to see if you’re able to secure a room on your wedding date. Incorporate a literary theme by making books part of your ceremony. Dress like your favorite characters, carry book page flowers, serve cake that looks like a book, you get the idea. Be mindful of library patrons as you celebrate, as you’ll want to be the first person married in the building but certainly not the last. People hate a noisy library and you don’t want to be the reason why they complain, now do you? 20. Horse Stables. If you love riding horses, incorporate them into your theme. If you have stables or know someone that does, ask if you can get married on their property. Instead of walking down the aisle, why not make a grand entrance on your favorite horse. People won’t stop talking about the cleverness of your wedding theme. Decorate with horseshoes (for good luck) and make it a Kentucky Derby type of theme. If you’re the bride, forget the veil and wear an ornate hat instead. If you’re the groom, choose a hat that complements the color of your suit. 21. A Tennis Court. Sports enthusiasts appreciate the feel of the court on a warm summer day. If you and your significant other love playing tennis, contact your local parks and recreation department to reserve a court for your ceremony. You can move your reception to a rotunda or roofed picnic area and enjoy the sunshine. Serve picnic food and a whole lot of smiles with your unique choice of venue. You probably won’t be charged to have your ceremony on the tennis courts but because it’s a public space but it is wise to have someone reserve the area for you. They’ll do their part to cordon off the court until you’re done exchanging vows. 23. A Nature Preserve. Outdoor weddings in spring and summer are the norm. 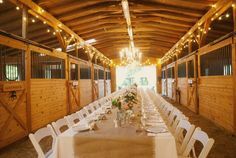 Talk to the head of your local nature preserve or nature center and see if you can reserve one of the outer buildings for your reception. Have your ceremony outdoors where nature is around every corner. Marvel at the wildlife you see and the flora and fauna that make pictures bright and interesting. Serve ice cold tea and lemonade along with cake. Invite others to share their photos by coming up with a hashtag for your special day. Tell everyone to post their pictures to their social media accounts using the special word or phrase. 24. A Natural Landmark. Celebrate your city’s personal history by finding a natural landmark with significance to be your wedding venue. Move your reception to a lodge or center. One of the easiest ways to save money on a venue is to have two locations in mind. Get married at the landmark which is free, and then move the festivities to a low cost area where people can sit down, eat, dance, and talk to one another. 25. A Historic Place. Look at the National Registry of Historic Places for inspiration. Find a building that interests you architecturally or historically. Ask permission to have your wedding ceremony and reception on the grounds. Some cities love the fact that people take interest in their historic buildings and grant you permission to get married there without any cost to you. Others require a non-refundable deposit to reserve the location. If you’re not sure if your city permits such a gathering on historic property, ask. You may be pleasantly surprised to learn that they do. Other ways to keep wedding costs down include booking your wedding on a Friday or Sunday. Saturday seems to be the most favored day for couples to get married. If you refrain from setting the date on this day, you’ll benefit from additional savings. Lesser known and cheaper venues like being booked, too, so they’ll be more than happy to accommodate your request at a deep discount. Getting married in the morning has its financial advantages, too. Dinner for guests is often costly. Skip the expense and serve brunch or lunch instead. You’ll be able to provide inexpensive food and not have anyone question your choice because of the time of day that it is. Choose a month when couples don’t ordinarily get married such as November or January. You’ll see even more savings by straying away from the most popular wedding months. You won’t have to worry about your choice of venue being booked on your chosen day, either. A fall or winter wedding offers a change of seasons as well as foliage and weather conditions, too. You won’t melt in the heat of the summer if you choose an outdoor venue for your wedding. You’ll see the leaves change color in the park or backyard location of your ceremony and reception. You’ll even have things like pinecones and acorns to decorate with if you’re having a rustic, outdoorsy theme. Another option that many budget-minded couples explore is finding new venues that offer discounts and savings. You may be one of the space’s first customers, so you’ll have to work out some logistics, but that doesn’t mean that you won’t benefit from the low-cost location provided to you. Ask the owner or manager of the space a lot of questions and make sure that you get a price quote in writing before making any promises or signing any contracts. As you can see, the world is your oyster when it comes to cheap wedding venues for your ceremony and reception. Now comes the difficult task of deciding which one is right for you. From city parks and gardens to art galleries and casinos, there’s a cheap venue for everyone. It’s all a matter of finding a location and reserving it before someone else beats you to it.